(Nanowerk News) The European FP7 project ArtESun aims to develop highly efficient organic solar cells with an increased lifetime and a decreased production cost. The ultimate goal of the ArtESun project is to bring organic photovoltaic technologies (OPV) towards introduction into the competitive thin-film PV market. The ArtESun project combines the multidisciplinary and complementary competences of top-level European research groups and industries in order to make significant steps towards high-efficiency (>15%), stable and cost efficient OPV technology. 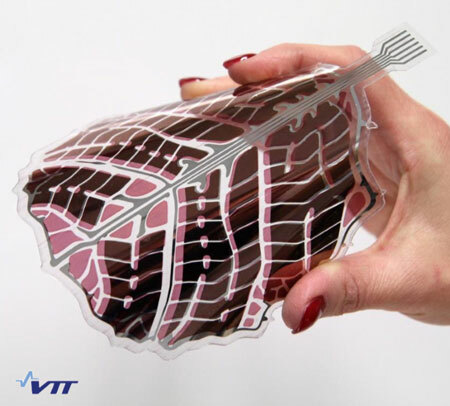 Customized shape and performance OPV "leaf" module produced using printing methods at VTT. The ArtESun project targets the production and system integration of similar OPV modules developed specifically for the selected demonstrator applications utilizing the flexibility of printed electronics in both technical and visual design. For this purpose, the project objectives are set to make break-through advances in the state of the art in terms of development of innovative high efficient OPV materials which can be used to demonstrate the cost-effective non-vacuum production of large area arbitrary size and shape OPV modules. Also, the aim is to understand the long term stable operation and the degradation mechanisms at the material and OPV device level, and develop roll-to-roll (R2R) additive non-vacuum coating and printing techniques emphasizing materials usage and cost efficient R2R processing. High performance arbitrary size and shape OPV systems will be demonstrated in environments relevant to its expected future applications. Within the framework of the ArtESun project, VTT collaborates with imec (Belgium), Fraunhofer ISE (Germany), Imperial College (U.K.), IKERLAN S.Coop. (Spain), Corning SAS (France), ONYX Solar Energy S.L (Spain), Confidex OY (Finland), Wibicom Inc. (Canada), and SAFC Hitech Ltd. (U.K.). The ArtESun project is partly funded by the European Commission. More information on the project progress will become available on the web http://projects.imec.be/artesun.